Each month we have events that repeat. When there is a gallery exhibit often there is an Opening Reception when you can Meet the Artists. Generally the receptions take place in the evening on the First Friday of the month which is also our Night Market on Magnolia. On the first and third Wednesdays the LCFA turns into an Art Lounge. The stage is open for anyone that wishes to share their talent (no politics, religion or profanity please). The Great Room is softly lit on the 3rd Wednesday as the focus is the stage, and brightly lit on the 1st Wednesday when the emphasis is on creating art. Both events are a fabulous way to meet members of the creative community, enjoy visual and performing arts and co-create. Don't miss any of these monthly happenings. 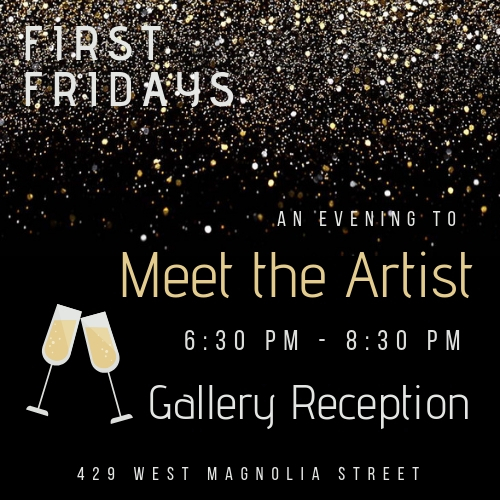 Several times a year on the first Friday of the month we open the gallery doors for a celebration and an evening where you can meet the artists showing in the gallery. Please check our online calendar for current exhibits. MAKE SOME ART - Bring something that you are working on or use supplies from the materials table. PRESENT YOUR ART - Whether visual or performance art we have the stage and the sound system all set. No pressure. MEET LIKE- MINDED PEOPLE - Sit alone, sit with your friends or try sitting at a table with people you have never met. Coffee & water is free or BYOB. We have two awesome monthly events wrapped up in one night. Visit Leesburg’s only Night Market happening every first Friday at 5 PM. Featuring regional Artists, Artisans, Crafters, Makers and Growers! Visit the gallery for the Meet the Artist Reception on the same night starting at 7p.m. FOR MORE INFO AND VENDOR INFORMATION Click here.